The government’s much vaunted freedom agenda entrenches a two-tier system of rights, with migrants and other unpopular minorities largely excluded. On 25 May 2010, the Queen’s speech promised: ‘Legislation will be brought forward to restore freedoms and civil liberties, through the abolition of Identity Cards and repeal of unnecessary laws.’ The following day, 26 May 2010, the Identity Documents Bill was introduced into parliament. Its provisions cancel the UK national identity card and the identification card for EEA nationals, and abolish the National Identity Register (NIR). Nick Clegg, introducing the Bill, described the ID card scheme as ‘wasteful, bureaucratic and intrusive’ and claimed the Bill was a major step towards dismantling the ‘surveillance state’. But non-EU citizens, who are required to hold biometric identity cards, are untouched by these proposals: the Bill does not include them, and the National Biometric Identity Service (NBIS), a scheme set up in 2009 under a £265 million contract with IBM, appears to be going ahead, according to the Immigration Law Practitioners’ Association (ILPA). Because the NBIS is non-statutory, it contains none of the safeguards of the NIR – and UK Border Agency has and uses vast powers of information-gathering on foreign nationals. There is no indication from the new government that these powers will be abandoned or curtailed. In opposition, the Lib Dems’ so-called Freedom Bill, published for the Convention on Modern Liberty in January 2009, contained a large number of proposals to restore and enhance civil liberties, including halving the period of detention without charge of terrorist suspects from twenty-eight to fourteen days, repealing the Prevention of Terrorism Act (which imposes draconian control orders on suspected terrorists), restoring the freedom to demonstrate outside parliament and restricting the length of time criminal suspects’ fingerprints can be retained by police – and many other measures. But there was no proposal to abolish fingerprinting of asylum seekers and certain migrants, and other clauses restricting police powers contained exceptions for immigration. By 20 May 2010, when the coalition agreement, with its commitment to restore civil liberties was published, even these proposals had been diluted, softened or simply disappeared. The Lib Dems’ proposals in relation to counter-terrorism had been replaced by a commitment to introduce ‘safeguards against the misuse of anti-terrorism legislation’. The proposal to restrict police retention of fingerprints had gone, replaced by a commitment to ‘outlaw the finger-printing of children at school without parental permission’. And the coalition’s commitment to restore the right to peaceful protest did not refer to Parliament Square – and as Conor Gearty pointed out (London Review of Books 10 June 2010), was accompanied by the noise of police evicting non-violent protesters from the square. CCTV cameras are not to be dismantled but will instead be regulated. These particular dilutions are significant. Among the resident population it is disproportionately black people whose fingerprints are taken (and retained) by police, while recently, many of those who engage in peaceful protest are Muslim, a hugely disproportionate number of those stopped and searched under terrorism laws are black, and all (or virtually all) of those arrested or subjected to control orders under the Prevention of Terrorism Act are Muslim. And in May 2010 it was revealed that Muslim areas of Birmingham have comprehensive CCTV coverage, paid for by the Prevent programme (but sold to residents purely as an anti-crime initiative). The Freedom or Great Repeal Bill has not yet been published. But when it is, black, Muslim and migrant communities will be watching to see whether they are included in deputy prime minister Nick Clegg’s, promise, in his 19 May 2010 speech, of ‘sweeping legislation to restore the hard-won liberties that have been taken one by one from the British people’. So far, the signs are not good. As part one of a two night special introduced by Bristol No Borders during Refugee Week (14th – 20th June) we present a number of short films portraying local and global resistance to the international border regime(s). These will include a film called “Passengers” made by local film maker-activist Lucie Jade in Calais. This serves as excellent prelude to tomorrow nights screening of “Welcome”. Lucie will be among panel of activists to answer your questions and facilitate discussion after the films. 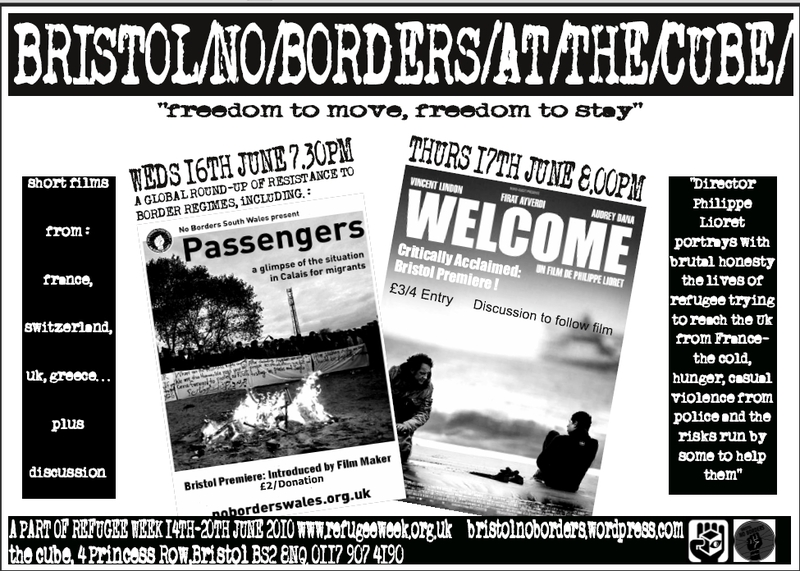 Following on from its huge success at the French box office Bristol No Borders and Calais Migrant Solidarity (Bristol) bring Welcome (2009) to the cube. The film will be followed by a short update on the current situation in Calais, a humanitarian crisis wildly distorted by the British media. solidarity in Calais with migrants. 17-year-old Iraqi Kurd bent on swimming the channel to be reunited with his girlfriend in London. The film’s chief revelation is the way French officialdom treats both the illegal immigrants and French citizens who assist them. They effectively bring back the terrible, corrosive spirit of the Occupation.’ Philip French, ‘The Observer’. The Con-Dem coalition has started an offensive against the most marginal and disadvantaged of all Britain’s minorities, Gypsies and Travellers. Putting aside brave new world soundbites on ‘freedom’, ‘fairness’ and civil liberties, the first wave of ‘efficiency savings’ has wiped out £30 million already offered to local authorities and housing associations to support the development of Gypsy and Traveller sites. New Labour in their own terms had pursued a genuinely progressive policy towards the desperate need of Britain’s remaining travelling Gypsies and Travellers. John Prescott driven by the ridiculous costs to local authorities of clearing up the ‘illegal’ encampments of Gypsies and Travellers pushed for a revival of the 1960s policies of pressurising local councils to provide sites. Labour was also pushed by the European Court in Connors v UK in 2004 to do something about security of tenure on sites. The Office of the Deputy Prime Minister (ODPM), later the Department of Communities and Local Government (DCLG), (how we will miss the acronyms of Labour ‘governance’!) set up its ‘Gypsy and Traveller Unit’, and embarked on ‘evidence based’ policymaking by forcing local government, as part of developing Housing Needs Assessments, to commission ‘Gypsy and Travellers Accommodation Needs Assessments’ (GTANAs). Counting Gypsies has always been fraught with racist overtones and the research was not always free from pressures from councillors and officers to make sure sites were not in their backyard. The government also issued new planning guidance circulars which, together with the results of the research showing the need for new sites and plots, was beginning to have the effect, albeit very slowly, of at least improving many of the appalling sites provided by local authorities and forcing them to plan a few more plots. A few Gypsy and Traveller families were winning planning appeals and a few were setting up their own new sites. The scale of the Gypsy ‘problem’ is remarkably modest. We have to remember that Gypsy and Traveller families with a travelling way of life have probably just 3,729 caravans on ‘unauthorised’ sites in the whole of England, with a further 13,708 caravans on council and private sites. And ‘It is estimated that the entire Gypsy and Traveller population could be legally accommodated if as little as one square mile of land were allocated for sites in England’. We have to keep this particular fact at the forefront of our minds when analysing the sheer scale of anti-Gypsyism in British political culture. The red-top and local press continued up to the election and beyond to provide the ‘racist wallpaper’ to debates. They were feeding on and fuelling perhaps the most virulent aspect of the common sense racism around in political debates – anti-Gypsyism. Throughout 2009 and into the election period the interaction of media and political discourses tended to reinforce the ‘common sense racism’ stereotypes of Gypsies and Travellers. ‘Cost’ and ‘mess’ and the effects of sites on house values dominate debate. The threat ‘they’ posed to a beautiful conservative rural England was perhaps summed up in February 2009 with the ‘threat to build a travellers site of 20 caravans half a mile from Camilla Duchess of Cornwall’s countryside home … at Reybridge, near Lacock, North Wiltshire’ on a former pony paddock. Objections were based on the site being near Lacock ‘an untouched 13th century village…a unique mediaeval village … a sensitive area’. Period dramas were filmed there – Pride and Prejudice, Cranford and Harry Potter – presumably without the ‘period’ Gypsies of the past. In the lead up to the election Express and Mail articles built on and fuelled the familiar narratives. ‘Gypsy camps’ were threatening to despoil ‘beauty spots’ and the heartlands of Tory voters in rural idylls like those in William Hague’s seat in Ripon in North Yorkshire: ‘The Gypsy capital of Britain will be a county famous for its quaint villages and rolling hills on the orders of Government planners. They have told Yorkshire to provide 255 new sites for Gypsies by the end of the year’. Not a word about the thousands of ‘our’ caravans already sited on the Yorkshire coast – one of the largest concentrations of holiday and residential caravans in Europe. Meanwhile ‘in the heart of Jane Austen country’, ‘living in a small village surrounded by rolling countryside, the residents of Ropley in Hampshire know how valuable their peace and quiet is’. Villagers raised £225,000 to buy back land from a Traveller threatening to seek planning permission for a site. The familiar conflict language was used and abused. ‘Gypsy Invaders' were producing a ‘battleground' for what ‘we’ all see as ‘Our Gypsy War’. There was also the ‘Battle of Hemley Hill’ in ‘an area of outstanding natural beauty’. Eric Pickles certainly identified with the ‘War’. Two days after the election in a major piece in the Daily Express Adrian Lee reported from the front line of ‘a community under siege’, Meriden in Warwickshire, ‘where 84-year-old Nancy Fulford is part of a campaign which has blockaded roads and has established ‘vigil’ camps to stop a Traveller site of seventeen caravans, one of which is now called ‘Camp Nancy’. ‘Her entire way of life is threatened by an unauthorised gypsy site within a few yards of her front door. A motley assortment of caravans, vehicles and diggers blights the outlook. The travellers overwhelmed the village without warning, using underhand tactics to try to avoid eviction’. Lee claims that on the (May) ‘Bank holiday Friday a planning application was lodged with Solihull Council, a few minutes before the offices were scheduled to close. It’s a common tactic used elsewhere, allowing Gypsies an extra day to get settled and start building work before enforcement teams return to work’. Eric Pickles obviously wants to be seen to be joining ‘Our Gypsy War’ in rural and suburban England. Our new communities secretary used his august office to actually issue an official government warning to local authorities on 28 May on the eve of another Bank Holiday, presumably clearing the ground for a legislative offensive against Gypsies and Travellers. ‘Communities and Local Government Secretary of State Eric Pickles is taking pre-emptive action to prevent unauthorised development over the coming bank holiday weekend. Mr. Pickles is writing to all Local Authority Chief Planners to warn them to be alert and ready for action if any significant planning applications get submitted before the bank holiday….Mr. Pickles is encouraging Councils to have planning officers on call over the weekend’ to prevent ‘ a small minority of people’, ‘illegally developing their land’ over the holiday. Gypsies and Travellers are routinely described as ‘illegally’ occupying land, contrasting them with the majority of law abiding citizens. Politicians and the media continue to portray Gypsies and Travellers not as the most deprived of all minority groups but actually being privileged, getting an advantage over middle-income Britain, the taxpayers. The Labour government also joined in the pre-election demonising of Gypsies and Travellers by issuing new punitive Guidance on managing anti-social behaviour related to Gypsies and Travellers which ignored any reference to inequalities and shortage of sites. The guidance for local authorities, the police and other agencies, set out the strong powers that are available to them in dealing with anti social behaviour associated with Gypsies and Travellers. Only very rarely does one see an interview with a Gypsy and Traveller organisation in the media – but this has been changing. Gypsies and Travellers have had organisations for many years – the Gypsy Council (http://www.grtleeds.co.uk/information/GypsyCouncil.html) was founded in 1966. In more recent years Irish Travellers established a national welfare organisation, the Irish Traveller Movement in Britain (http://www.irishtraveller.org.uk/), which was set up in 1999. Gypsies and Travellers have also had to organise and fight to retain the summer round of horse fairs – the only way in which families, communities and organisations can ‘network’. The major fairs at Appleby in Cumbria and Stow have survived, but many other local fairs have been harassed and disappeared. Gypsy and Traveller organisations have also been effective when they have forged alliances with Gorjas (non Gypsies), particularly lawyers and activist academics. In 1995 a Traveller Law Research Unit was set up at Cardiff University and with a Traveller Law Reform Bill published in 2002 the Gypsy and Traveller Law Reform Coalition was founded. Thomas Acton, professor of Romany Studies at the University of Greenwich, also promoted a string of books from the University of Hertfordshire Press including the influential Here to Stay: the Gypsies and Travellers of Britain. These alliances and campaigns have also produced action in parliament with evidence to select committees and investigations and the establishing of the All Party Gypsy and Traveller Law Reform Group with the assistance of Lord Avebury. Three of the contenders for the Labour leadership John McDonnell, Diane Abbott and, perhaps interestingly, Ed Balls were, in the last parliament, members of this Group. The Group also included prominent Conservatives Caroline Spelman, the new environment secretary and Peter Bottomley, along with some Lib Dem MPs and Lord Avebury. Their efforts seemed to have produced a small amendment to housing law which would have given Gypsies and Travellers a few more rights to security on existing sites – apparently lost in the ‘wash up’ period before the election. Pressure on the Labour government produced some results for Gypsy and Traveller campaigners and organisations. Building on the existing network of Travellers Education projects at a local level, the government introduced in June 2008 Gypsy and Traveller History Month with an emphasis on positive images of Gypsies and Travellers. The Lottery Fund helped establish Travellers’ Times as a voice for Gypsies and Travellers. Other groups managed to access funds too. These funding gains were augmented by some token involvement in consultative and advisory bodies, including briefly having a Romany Gypsy Commissioner on the Commission for Racial Equality (CRE). The CRE (now the Equality and Human Rights Commission – EHRC) started actually recognising the existence of Gypsies and Travellers with its Common Groundreport of 2006 and monitoring policy progress in its 2009 report Gypsies and Travellers: Simple Solutions. The early cuts targeting Gypsy and Travellers have already been met with protests from Gypsy and Traveller organisations and their allies. Facebook sites are organising demonstrations and protests – no doubt being developed at Appleby Fair from 3-7 June A network of academics, researchers and campaigners have signed protest letters. (Read an IRR News story: ‘Defend the remaining travelling Gypsies and Travellers, and Showmen’ (http://www.irr.org.uk/2010/june/ha000019.html).) The campaigning this time needs to be effective, as the web petitions claim, that there is a real threat of ‘ethnic cleansing’ of travelling Gypsies and Travellers and the disappearance of the few who remain. References:  Connors v UK, download the judgment Count of Gypsy and Traveller Caravans – July 2009 (http://www.grtleeds.co.uk/information/downloads/Strasbourg_Judgement.doc), Department of Communities and Local Government (DCLG). Gypsies and Travellers: simple solutions for living together, Equality and Human Rights Commission (EHRC), March 2009. Eugene Henderson, ‘Gypsy Camp Crackdown’ (http://www.express.co.uk/posts/view/176672/Gypsy-camp-crackdownGypsy-camp-crackdownGypsy-camp-crackdown), Sunday Express, (23 May 2010). Joanna Richardson, The Gypsy Debate: Can discourse Control?, Exeter: Imprint Academic, 2006. Martyn Brown, ‘7,500 sites for Gypsies on the way’ (http://www.dailyexpress.co.uk/posts/view/72245), Daily Express, (21 November 2008). Jon Land, ‘Anger over travellers’ site near Camilla’s countryside home’ (http://www.24dash.com/news/Housing/2009-02-12-Anger-over-plans-for-travellers-site-near-Camillas-countryside-home), 24dash.com, (12 February 2009). Charlton, ‘Beauty spots for Gypsy capital’, Sunday Express, (4 April 2010). Eugene Henderson, ‘Gypsy Camp Crackdown’ (http://www.express.co.uk/posts/view/176672/Gypsy-camp-crackdownGypsy-camp-crackdownGypsy-camp-crackdown), Sunday Express, (23 May 2010); Michael Pickard, ‘Villagers raise £225K to buy off Gypsy invaders’ (http://www.express.co.uk/posts/view/175533/Villagers-raise-225k-to-buy-off-gypsy-invadersVillagers-raise-225k-to-buy-off-gypsy-invadersVillagers-raise-225k-to-buy-off-gypsy-invadersVillagers-raise-225k-to-buy-off-gypsy-invaders), Daily Express, (17 May 2010); Luke, Salkeld, ‘After the human blockade against Gypsies, a village whose £225,000 whip round has kept out travellers’ (http://www.dailymail.co.uk/news/article-1278796/How-residents-sleepy-village-pooled-resources-buy-gipsy-family.html), Daily Mail , (12 May 2010). Michael Pickard, ‘Villagers raise £225K to buy off Gypsy invaders’ (http://www.express.co.uk/posts/view/175533/Villagers-raise-225k-to-buy-off-gypsy-invadersVillagers-raise-225k-to-buy-off-gypsy-invadersVillagers-raise-225k-to-buy-off-gypsy-invadersVillagers-raise-225k-to-buy-off-gypsy-invaders), Daily Express, (17 May 2010). Eugene Henderson, ‘Gypsy Camp Crackdown’ (http://www.express.co.uk/posts/view/176672/Gypsy-camp-crackdownGypsy-camp-crackdownGypsy-camp-crackdown), Sunday Express, (23 May 2010). Adrian Lee, ”Our Gypsy War” (http://www.express.co.uk/posts/view/173920), Daily Express, (8 May 2010). Eugene Henderson, ‘Scandal of unwanted Gypsy sites’ (http://www.express.co.uk/posts/view/156691/Scandal-of-unwanted-gypsy-sites-Scandal-of-unwanted-gypsy-sites-Scandal-of-unwanted-gypsy-sites-Scandal-of-unwanted-gypsy-sites-Scandal-of-unwanted-gypsy-sites-Scandal-of-unwanted-gypsy-sites-Scandal-of-unwanted-gypsy-sites-Scandal-of-unwanted-gypsy-sites-Scandal-of-unwanted-gypsy-sites-Scandal-of-unwanted-gypsy-sites-), Sunday Express, (7 February 2010). Adrian Lee, ‘Our Gypsy War’ (http://www.express.co.uk/posts/view/173920), Daily Express, (8 May 2010). ‘Eric Pickles calls on councils to crackdown on unauthorised bank holiday building’ (http://www.communities.gov.uk/newsstories/planningandbuilding/1602649), Department of Communities and Local Government (DCLG), 28 May 2010. Royce Turner, ‘Gypsies and British Parliamentary language: an analysis’, Romani Studies, Vol. 12, No. 1, 2002, pp 1-34. Cyril Dixon, ‘Gypsies who get interest free loans courtesy of you’ (http://www.express.co.uk/posts/view/167869/Gypsies-who-get-interest-free-loans-courtesy-of-you), Daily Express, (8 April 2010). Guidance on Managing Anti-social Behaviour related to Gypsies and Travellers (http://www.communities.gov.uk/publications/housing/anti-socialbehaviourguide), Department of Communities and Local Government (DCLG), March 2010. Colm Power, Room to Roam: England’s Irish Travellers, 2004. p30. Download here (http://www.irishtraveller.org.uk/images/roomtoroam.pdf) (pdf file, 1.7mb). Colin Clark and Margaret Greenfields, Here to Stay: the Gypsies and Travellers of Britain, University of Hertfordshire Press, 2006. Common Ground, Commission for Racial Equality, 2006; Gypsies and Travellers: simple solutions for living together (http://www.equalityhumanrights.com/hafan/prydain-decach/cysylltiadau-da/gypsies-and-travellers-simple-solutions-for-living-together/index.html), Equality and Human Rights Commission, 2009. IRR is not responsible for the content of external websites. Inclusion of a link does not constitute an endorsement. Please contact us (/contact/index.html) if you come across a broken link. Inclusion of a link does not constitute an endorsement. Please contact us if you come across a broken link.